Sometimes, my husband has after-work meetings and might not be home for dinner. Not interested in cooking a big meal for myself, and not wanting takeout, I often look at what we already have in the refrigerator. Almost always, we have eggs. If you're looking for a quick, easy, balanced, go-to meal that you can eat for breakfast, lunch or dinner, then this is for you. Serve it with whatever you have in the house...fruit, a salad, or toast or English muffin. It hits the spot every time. This is what I used. Everyone has different tastes and you need to add what you like. There are so many variations in protein and veggies...make it yours. Any other veggies you have on hand. I have used a half pepper, shredded cabbage, and a handful of spinach. Sometimes, all three. 2 eggs, beaten or 1/2 cup egg substitute...your choice. 1. Preheat your skillet with olive oil. Add your onion (and pepper, if used) and saute until translucent, about 5-6 minutes. Add the garlic and salt and pepper. Saute for another 5 minutes. 2. 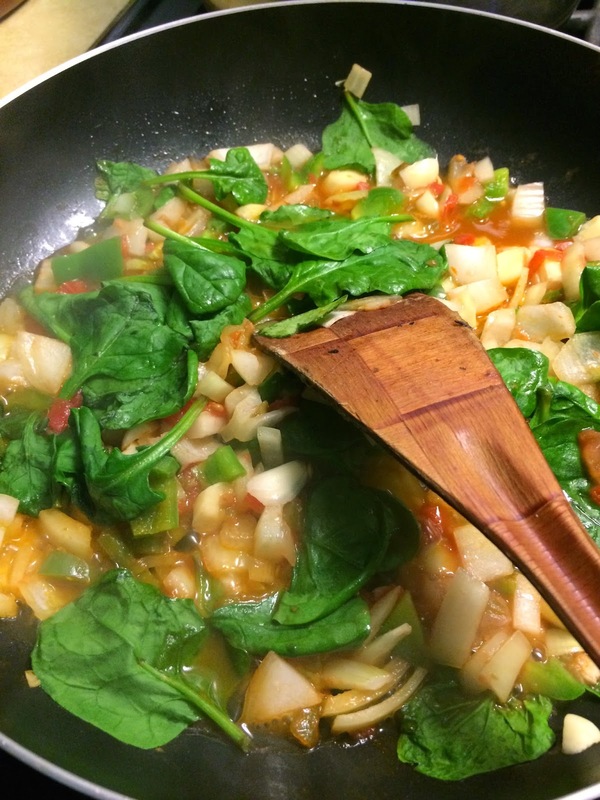 Add salsa and any other veggies you want and cook until the veggies are tender. 3. Add the eggs. Place the cheese across the middle of the cooking eggs. 4. Start to fold the edges up and over as you might with an omelet. 5. When the eggs are cooked to your preferred degree of done, spoon the mixture into a bowl. 6. Top with more salsa and scoop scored avocado onto the top. Salt and pepper to taste. What is your go-to meal when you don't feel like cooking? 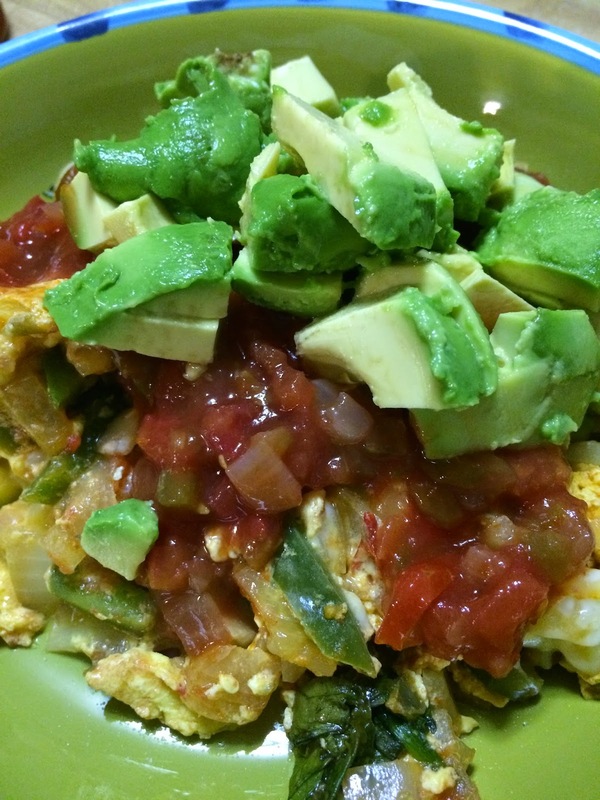 I love making breakfast scrambles to use up some of the veggies in my fridge. I also love adding salsa to my breakfast dishes. So good! Delicious! 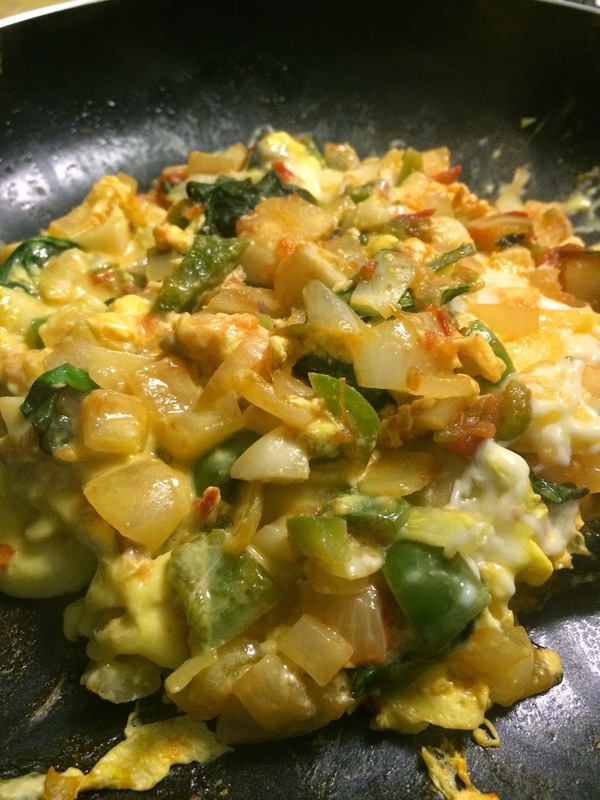 Eggs are always a great fall back meal because they're versatile and a great protein. I went to a place in Texas that fried avocados. I know it's wrong to take something so healthy and fry it, but that would be so yummy on this recipe. This looks Delicious! I will have to try it! Also looks budget friendly which is a must have at the moment. I have chickens, so I always have eggs. This is a great way to use them up. Pinned it! This looks delicious! I love that it has the ability to have ingredients added or removed based on diet needs. My husband and I are started the Whole 30 today, but we could easily adjust it to the diet. Hi Kelly, Nice, quick meal. Well, I've just prepared Curried Bauble and Squeak topped with a poached egg for the Cottage Cooking Club this month, pretty good actually. That sounds delicious! You can't go wrong with eggs! My go-to tends to be kielbasa or Chorizo I always have some in the house. Not a big fan of avocado, never liked the texture of it. However this looks so yummy and it's healthy. I'm definitely going to pin it and give it a try. When I don't feeling like getting creative, a bean bowl with the Mexican flavor theme is ALWAYS my go-to! Looks great. Whenever I am stumped on dinner, I always look to eggs. I do too, Amanda. Quick source of protein and they go with just about everything. Thanks so much! I will eat eggs for any meal. Scrambled eggs with black beans and salsa in a burrito sounds like a great breakfast option though. Avocado is divine, isn't it? Love! Mexican is almost always a good idea. The flavor palette is hard to beat. I love it. It's a go-to, for sure. Put in what you like. Make it yours. The beauty of go-to recipes like this is that you can customize it to make it your own. Put in whatever you like. Favorite things...favorite meal. I will eat eggs for any meal. We love kielbasa and chorizo too...actually, most sausages. So good! Hi Peggy! I am going to google bauble and squeak, but generally speaking, I like most curries. I look forward to reading and seeing more. The beauty of go-to recipes like this is that you can customize it to make it your own. Put in whatever you like. Favorite things...favorite meal. Good luck with the Whole 30! You're lucky, Cari! What a wonderful treat to have fresh eggs. Thank you so much for pinning. You might like this recipe too. http://www.alovelylifeindeed.com/2014/09/tortilla-espanola-recipeany-meal-anytime.html Enjoy! Agreed. It's hearty, healthy and budget-friendly. Here's another egg recipe that we have one a week or so... http://www.alovelylifeindeed.com/2014/09/tortilla-espanola-recipeany-meal-anytime.html Enjoy! Fried avocados? Like deep fried? I have heard of baked and grilled avocados, but never fried. Does it change the flavor? Interesting! Agreed. We eat a lot of eggs, for all meals. And the beauty of go-to recipes like this is that you can customize it to make it your own. Put in whatever you like. Favorite things...favorite meal. Once you find the right salsa, it's magic. It's a great way to use up veggies too. Thanks so much for stopping by!